I'm currently on the island of Crete, just finishing up a meal of paximadi. Paximadi (παξιμάδι) is a kind of hard, twice-baked bread that is common in Greece. To a person who has never seen it before, it looks like stale bread. Someone at a hostel once threw my bag of paximadi in the trash with a loud clunk, because they thought it had gone bad. To prepare the paximadi, it is rinsed off in water to soften it. I've seen it in two common dishes on Crete: dakos (ντάκος) and Cretan salad. 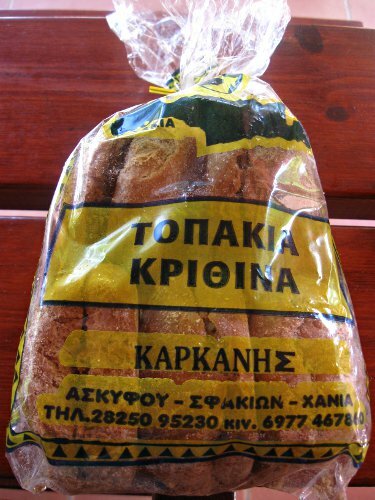 There are a few types of paximadi, and the picture above may not exactly be "paximadi", because the bag says topakia krithina (ΤΟΠΑΚΙΑ ΚΡΙΘΙΝΑ) and not "paximadi". I don't know what "topakia" is, but I think krithina is barley. 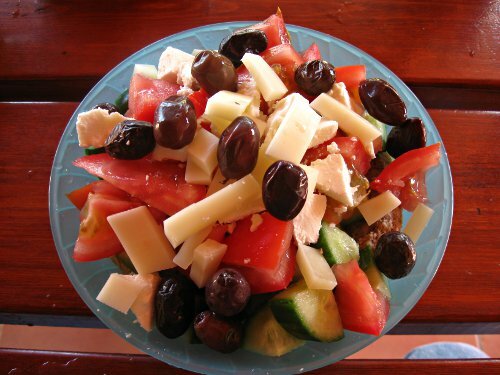 A Cretan salad (as I've had it in restaurants), is a Greek salad with paximadi on the bottom. 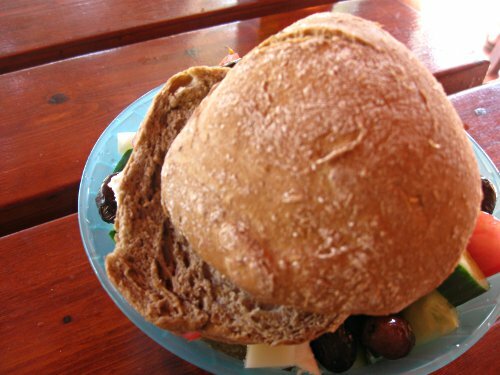 Dakos is similar, but is a round piece of the hard bread with ground tomatoes, cheese and olives on top. 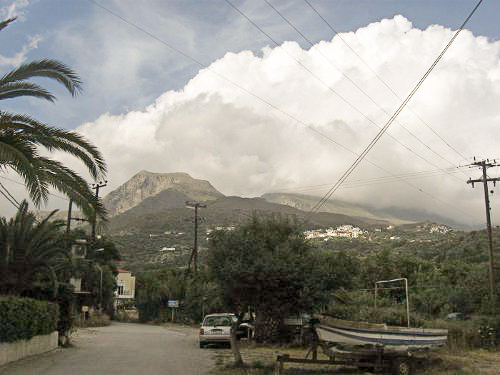 EDIT: dakos is also known as koukouvagia (κουκουβάγια) in some places. Koukouvagia means "owl" in Greek. Thanks to Chris for the tip. Then I poured a little olive oil and wine vinegar over them. Chopped tomatoes, cucumbers, onions, olives and cheese went over the paximadi, with more olive oil, vinegar, and some salt. Normally, I just use feta cheese, but I had some local graviera cheese from the village on the hill, so I added that too. Graviera (γραβιέρα) is a tasty Cretan cheese made with sheep and goats milk. 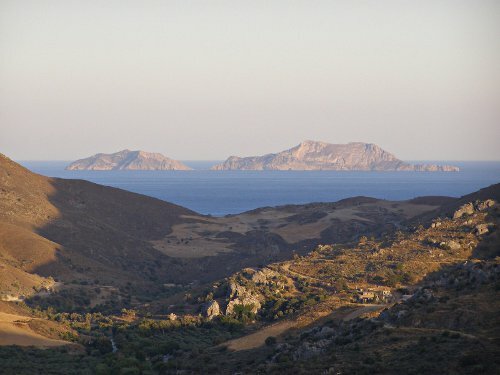 There are two islands off the southern coast of Crete called "Paximadia" (the plural of "paximadi" in Greek), because they look like paximadia. According to Greek mythology, Apollo and Artemis were born on these islands. Some people don't like paximadi, but I've acquired a taste for it. It's a great staple for solo travelers in Greece because a regular loaf of bread goes stale before one person can finish it, while paximadi doesn't go bad. It's also typically made with whole grains. I'm also fascinated by it because I read about how John Muir used to travel in the wilderness with nothing but bread. I suspect that Muir carried something like paximadi that was light, and could be reconstituted in water. Give it a try if you visit Greece! Submitted by Eva in Athens, Greece (not verified) on Sat, 07/09/2011 - 02:31. Dakos is definately a favourite!